Blissfully void of South East Asia’s usual backpacker crowd, the tiny city of Vientiane oozes sleepy charm, reveals Gaby Doman. 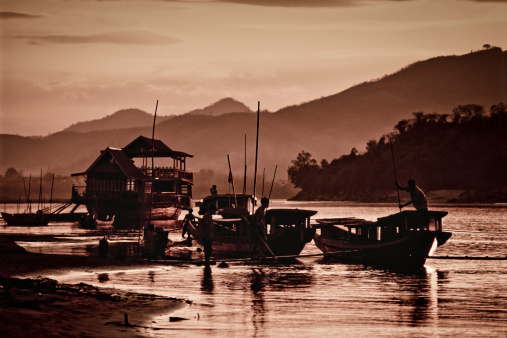 of untouched islands and pristine beaches but, to overlook Laos is to miss out. And, after a hectic city break in Vietnam or a sleepy vacation on a Thai island, the capital of Vientiane may provide just the right balance of stimulus, relaxation and culture you’re looking for. Vientiane sits just a hop over the Mekhong River from Thailand. In the 1800’s the city was conquered by the Thai army and was rebuilt, decades later, by the French. The remnants of the French colonisation of the city is evident everywhere; it’s in the street names, much of the architecture, the wide, sweeping boulevards and the food. Unlike Saigon, Bangkok or Phnom Penh, Vientiane is a city that easily seduces visitors with its crumbling mansions, French eateries, coffee shop culture and streets that just beg you to hop on a bike and explore its temples, Buddha gardens and stupas. local beer in riverside bars. There’s something about Vientiane that makes you want to linger; perhaps it’s the low prices or the year-round off-season feel to the city or the amiable nature of the locals. It’s no wonder writers tapping away on their latest books or artists getting started on their masterpieces are such a common sight in the corners of the city’s restaurants. Though it’s easy to get swept up in the French-inspired boutiques and refined restaurants for your entire stay in the city, there’s another side to Vientiane, which is what makes it all the richer to explore. As much as you’ll appreciate the good wine and availability of exquisite pastries, the flip side are the hot and sticky markets stuffed with locals hawking sundried chillies, strings of garlic and bunches of leafy herbs; the old men pushing carts of exotic fruits through the city and, of course, there are reminders of Laos’ communist side, most evident at the vast empty square near That Luang temple and in the flags flying high along the riverside. By night, the city’s residents flock to the small night market on the riverfront, where textiles and silver make for the best bargains, if you have the haggling skills. Nights tend to end early in Vientiane with riverside drinks and lengthy meals but, if you’re determined to make the most of it there are some riverside clubs that cater primarily to locals but are very welcoming for tourists too; expect plenty of karaoke or cover bands and sickly sweet cocktails.